Did you think I fell off the face of the earth? No, I’ve just been busy moving Bat Converter up to its Alpha release. Bat Converter is a Windows-only tool I developed to automate a process in which I regularly engage – converting video formats. 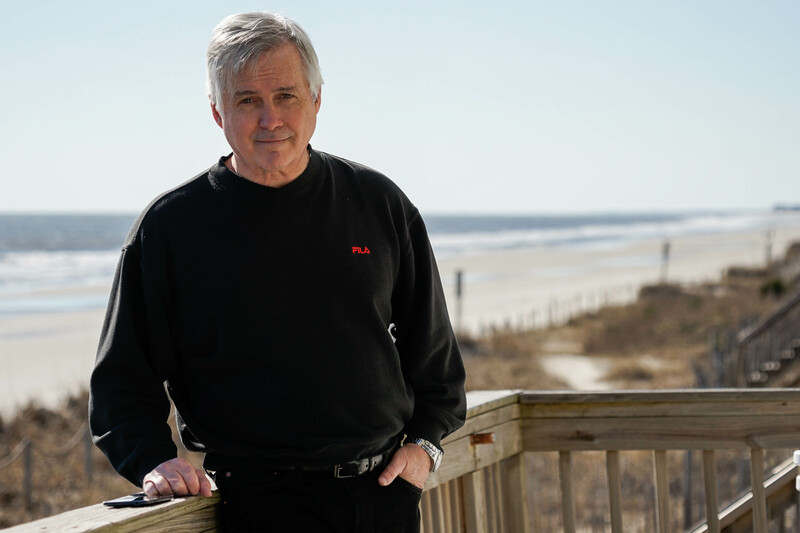 The three options are to set it up to (1) convert TV Recordings to mpeg, (2) convert any other video to a format compatible with the iPad or new iPhone as well has many Android devices (like my Droid Incredile), and (3) to convert to an iPad version, an iPhone 3GS version, an OGV version, and a flash video. That’s right, Option 3 generates four output files for every one that you feed it. Conversions occur in a minimized console. When they are complete the destination folder will open with all your newly converted videos. Other than the .wtv to .dvr-ms conversion, there is no progress window. Converting videos is a long process. I like to run my program and go to bed. In the morning, there is my window open with all those files ready to do my bidding. Specifically, I record TV using the Media Center in Windows 7, but I want to be able to watch it on my wife’s iPad, one of the few XP notebooks, or the Tivo HD. That means the Windows TV (wtv) container has to be changed. (Bat Converter uses the Windows 7 WTVConverter utility to generate the episode in the dvr-ms format.) The original and this copy are left in the original folder. The dvr-ms episode retains all of the original metadata and quality. The dvr-ms episode is then converted to mpeg at the same quality level but without the metadata. (Somebody please tell me how to retain the metadata.) The conversion from dvr-ms to mpeg is done using an older version of FFmpeg. The newer releases seem to have this ability broken. By putting this mpeg version in the My Tivo Recordings folder, I can watch it on my Tivo in the other room (or change the name to the right format and watch it on XBMC). By default, I place the mpeg version in the ‘Videos2Convert’ folder. Along with most other formats (and more to come in future releases), any videos in this folder can be converted using option 2 or 3. This is accomplished using the newer version of FFmpeg. This software uses code of FFmpeg licensed under the LGPLv2.1. This software uses libraries from the FFmpeg project under the LGPLv2.1. Since I have included the libx264 libraries, be advised that they cannot be used for any commercial purpose and are subject to the restrictions of their copyrights. We like to have some shows on the iPad in case we get rained in at camp. Using Option 2 and changing the output folder to the ‘Automatically Add to iTunes’ directory, makes those videos available the next time I sync the iPad with iTunes (find them under ‘Movies’). I also use option 2 to convert videos family members have recorded in the myriad of current formats used by today’s cameras. Less often, I’ll use it to convert videos I downloaded from the internet. The third option is handy for those of us who want to post videos for HTML5 compatible browsers. It generates the three top formats. By using those three formats with the <video> tag, the video can be used with the latest version of all the major browsers. A bonus flash video is also generated just in case you want to degenerate to flash for users confined to older non-HTML5-compliant browsers. 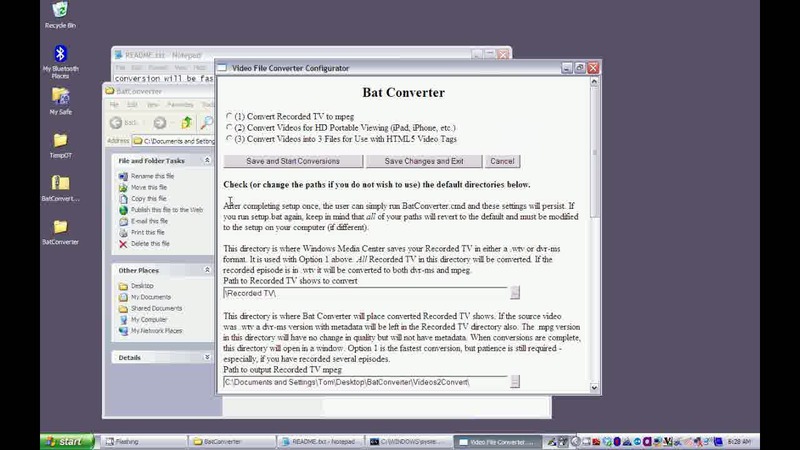 Bat Converter can be placed anywhere on your computer. You could even make three copies and configure one for each option. Every time you run setup it reverts to the original default path configuration, though, so make sure the paths still point to the right place before you click one of the ‘Save” options. A further note. The graphical user interface (GUI) for configuration is on the MS Internet Explorer/Windows Scripting Host platform so if you don’t have those you’ll have to change the ‘batconverter-configuration.dat’ folder manually and skip running ‘setup.bat.’ I tested Bat Converter on four computers and the GUI did not function fully on one of them. I have one more project I want to finish using batch files, VBScript, and HTA. Then, I’ll start working on learning a language that is less platform specific. I love Linux, but I had to start somewhere and since I use Windows as my DVR . . . This is an alpha release. Your comments and feedback can help to make further versions better. If anyone at FFmpeg or MPEG LA has a problem with how I’m distributing, I am happy to change or pull my product. If you would like to thank me for building this for you, please feel free to make a donation to Habitat for Humanity ($3 suggested). UPDATE: Per the comment below,There was a glitch in the initial release by which the ‘Save and Run’ button during setup only saved. That button has been removed. Please save the setup and then just run BatConverter.cmd until you need to change the setup. Then just run ‘Setup.bat’ again to make and save your changes. This entry was posted in Geeky and tagged Bat Converter, BatConverter, html5, iPad, Tivo, transcoding, video, video conversion. Bookmark the permalink. There was a glitch in the initial release by which the ‘Save and Run’ button during setup only saved. That button has been removed. Please save the setup and then just run BatConverter.cmd until you need to change the setup. Then just run ‘Setup.bat’ again to make and save your changes.